NUTLEY, N.J. -- The mystery surrounding the gravestone bearing the name of 8-year-old "Max Ferreira" has been solved. The Nutley, N.J., Police Department said an employee at the New Jersey Transit Bus Terminal on Washington Avenue who was doing an annual cleanup found it earlier this month and called to report it. 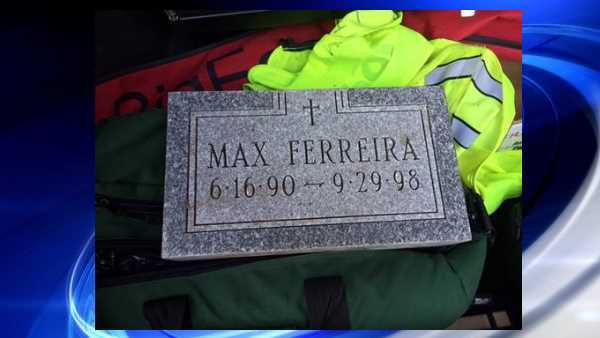 The 14-inch by 8-inch grave marker has the name "Max Ferreira" carved into it and is dated from June 16, 1990 to Sept. 29, 1998. Police said Max was a rottweiler who belonged to a former Newark resident who died in 2005. It's still not clear how the headstone ended up at the garage. Police said an alert was sent to nearby law enforcement agencies and officers called local cemeteries to see if a gravestone is missing.